I will be the first to admit that Southern-style collards are not for everyone. Called "slow-cooked" collards, they are traditionally boiled to death at low temperature with a ham hock and a measure of salt. At the end they're salty, wet, and sort of grey-green. We didn't eat a lot of collards in my house. So when I opened our CSA bounty-bags this week and got to see collards in their natural, uncooked form for the first time, I realized that they might still have potential. 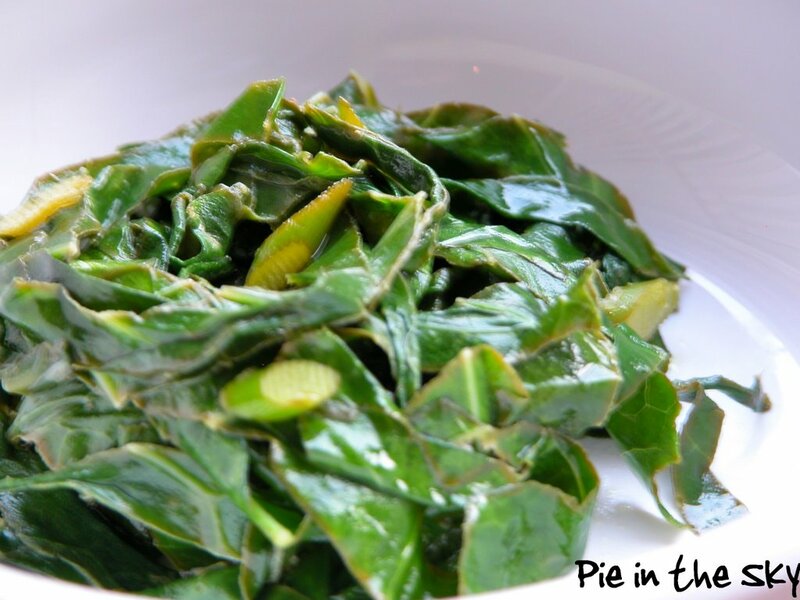 The recipe I came up with is a simple sauté that utilizes those delicious, in-season garlic scapes and makes the collards tender while retaining a toothsome crunch. Combine butter and olive oil in a sauté pan and melt over medium heat. Add scapes or minced garlic and sauté briefly, about thirty seconds. Add collard greens; sauté, turning frequently, about 5 minutes or until crisp-tender. Add lemon juice and cook 1 more minute. Remove from heat, salt to taste and serve immediately. 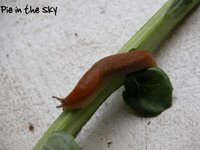 ...And one collard-happy slug who survived, unbeknownst to us, overnight in the refrigerator, before being discovered and returned to the great outdoors. Bet you never see that in a supermarket! Yeah, no ham hocked collards for me either--I know some people love them (everyone I'm related to except my sister, in fact), but the memory of that slimy texture gives me the willies. Your sauteed ones look delish, though, and greens are so good for you. Thanks for an alternate preparation; maybe I'll grab some at the market this week! Doesn't look like any collards I've ever had,(maybe that's why I never liked them) but where are the pinto beans and corn bread? jennifer - i hope you enjoy them! and i thought i was doomed to hate collard greens for the rest of my life because i couldn't eat green stringy mush with vinegar poured all over it. my father will be ecstatic about this better way to eat collards since he loves the things and i'm excited about a new potential green veggie! I haven't ever been successful at avoiding the grey-green, but I have loved other's collards quite well in my life. I'll have to try this! At least when you get bugs in your produce you know it's organic, right?! It's the darn fruit flies that come after I get it home that drive me crazy! Good recipe, I tried it out. The way I cook them these days is to use a method similar to this one that entails sauteeing up some onion and bacon in olive oil over high heat, throwing some vinegar in (red wine is good, balsamic lends an interesting taste, too) to deglase after the bacon has rendered some fat, toss in my greens with a can of chicken stock (14 oz), cover and simmer it all for about 15 - 20 minutes. Quick Greens, I call it. Mighty tasty, too. This is a good recipe you have, though, and foregoing the pork is probably healthier. It's hard for me to imagine greens without it, though. Thanks! Be well.